For many years, I have said that the major focus of business throughout the 20th century was professional management – new management theories, management schools, management consultants, and management gurus – whereas the focus for the 21st century would be governance. I think we can safely say that this has happened. If ‘management’ and ‘governance.’ are used interchangeably, the fundamental distinction between the two is lost. The notion of management as a hierarchy is commonplace: the classical management pyramid showing a chief executive officer, or managing director, with overall managerial responsibility and the reporting relationships of the managers down the management hierarchy. Authority and responsibility are delegated downwards, with matching accountability expected upwards. The board of directors seldom appears- because the board is not part of the management structure; nor is it a hierarchy. Each director has equal responsibility and similar duties and powers under the law. There is no executive ‘boss’ of a board. In a unitary board, that is a board with both executive and non-executive outside directors, the executive directors hold managerial roles in addition to their responsibilities as directors. As executives, they are employees of the company and employment laws apply. Directors, as such, are not employees and company laws apply. Executive directors, of course, wear two hats: and are subject to both company law and employment law. In the two-tier board structure, the executive board consists entirely of executives and is responsible for management. The supervisory board consists entirely of outside members and is responsible for governance, including the hiring and firing of management. In other words, management is responsible for running the business. The board is responsible for its governance, ensuring that the corporate strategy is appropriate and being achieved, that corporate policies are in place, overseeing management’s performance, and being accountable to investors and other legitimate stakeholders. Briefly, management runs the business; the board ensures that it is being well run and achieving is objectives. The concepts and the responsibilities of management and governance are quite different. To conflate the two invites confusion. Commentators frequently mention the importance of culture in corporate governance. They recognize that the ‘comply or explain’ regime of adherence to corporate governance codes does not capture the reality of corporate behaviour, But there seems to be some confusion about what is meant by culture and why it is really relevant to corporate governance. Culture can be thought of as the beliefs, expectations and values that people share. Like the skins of an onion, culture has many layers – national cultures, regional cultures, the culture of a company, and the culture in a board room. The culture of a country is influenced by its social, economic and political heritage, its geography, and its religion. Culture is moulded by situations that affect relations between individuals, institutions, and states. Culture is influenced by law, is reflected in the language, and is passed on by experience in families, schools, and organizations. It is culture that determines what is thought of as acceptable, important, and right or wrong. Culture affects how people think and act. 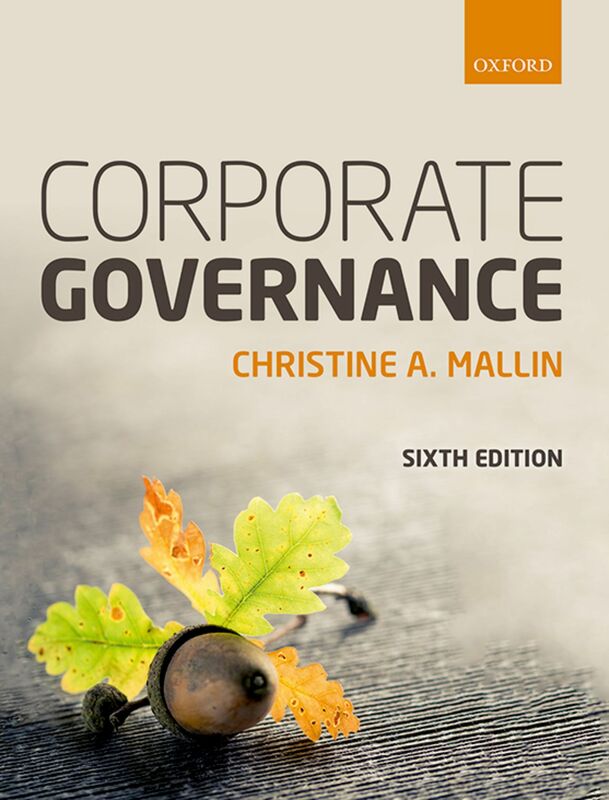 It is fundamental to understanding corporate governance. In the late twentieth century, when ideas about corporate governance began to be discussed, much of the thinking and practice was influenced by countries that shared Anglo-American cultures – a belief in the rule of law; the importance of the rights of individuals to personal freedom and the ownership of property, in the context of accountable, democratic institutions, including an independent judiciary. In the United States, corporate governance practices stemmed from the rule of company law laid down by state jurisdictions and at the Federal level by regulation from the US Securities and Exchange Commission. In the UK, and subsequently in most Commonwealth countries associated with the UK, the governance of companies was determined by Companies Acts and, for listed companies, by corporate governance codes, reinforced by Stock Exchange rules, which required companies to report compliance with the code or explain why they had not. Religious beliefs are part of the culture of every country and affect personal values, relationships, and attitudes to authority. They influence morality, ethical standards, and what business behaviour is considered acceptable. Under-pinning beliefs are reflected in the way business decisions are made, corporate entities operate, and corporate governance practices develop in different countries. The United States was founded by Puritans seeking religious freedom. The founding fathers, the majority of whom were lawyers, placed great emphasis on their constitution, the rule of law, and democratic rights. Those same traits are reflected in the governance of American companies to this day. Legal contracts, litigation, and shareholder rights are still at the forefront of business issues. In the United Kingdom, on the other hand, the approach to corporate governance was more flexible, less rule-based and litigious, reflecting the broader traditions of Britain’s religious inheritance. The Church of England, rejecting control from Rome, established a freedom of expression and tolerated other non-conformist religious traditions, which became embedded in British culture. The voluntary approach to corporate governance – ‘conform or explain why not’ – reflects this more flexible, voluntary approach. Other countries influenced by Britain during the days of the British Empire (including Australia, Canada, South Africa, other countries in Africa and the West Indies, as well as Hong Kong and Singapore, shared these corporate governance influences. In Germany, the teachings of Martin Luther, 500 years ago, shaped the country’s language and changed its way of life. Luther influenced belief in the moral imperative to seek principle and order, to be prudent with money, and to avoid debt. Southern European nations, on the other hand, influenced by Roman Catholicism, took a less austere approach: a distinction that is still being played out among the nations that adopted the Euro as their national currency. Northern European nations were also affected by the teaching of John Calvin, which emphasized the importance of working for the community, not just for their families and themselves. Germany’s co-determination laws view companies as partnerships between labour and capital. In the two-tier board governance structure, the supervisory board contains representatives of workers as well as investors. The influence of religion on corporate governance practices can be seen strikingly in Japan. Buddhism and Shinto, the national religion, have been dominant religious influences. Even though relatively few Japanese now identify with either religion, belief in spirits is widespread. Shrines to spirit deities are commonplace. Social cohesion is a dominant feature of Japanese business life, with high levels of unity throughout the organization, non-adversarial relationships, lifetime employment, enterprise unions, personnel policies emphasizing commitment, initiation into the corporate family, decision-making by consensus, cross- functional training, and with promotion based on loyalty and social compatibility as well as performance. The Japanese Keiretsu networks connect groups of Japanese companies through cross-holdings and interlocking directorships, Chairmen and senior directors of companies in the keiretsu have close, informal relationships. Although the paternalistic relationship between company and lifetime ‘salary-man’ is under economic pressure, boards still tend to be decision-ratifying bodies rather than Western style decision-making forums. Although there have been recent efforts to require independent non-executive directors, as in the Western corporate governance model, Japanese top management remains rather sceptical. Many Japanese do not see the need for such intervention ‘from the outside’. Indeed, they have difficulty in understanding how outside directors function. ‘How can outsiders possibly know enough about the company to make a contribution,’ they wonder, when they themselves have spent their lives working for it? How can an outsider be sensitive to the ingrained corporate culture? Of course, the cultural significance of religion does not mean that religion or religious organizations played a part in the development of corporate governance norms. Indeed in some countries, the UK, China, and Japan for example, many people no longer claim any religious affiliation. But the religious culture provided the ethical context, the moral influence in creating law, running business, and influencing approaches to corporate governance. When corporate governance norms were first discussed in the 1980s, many thought that corporate governance in countries around the world would gradually converge with Western practices. They believed that because these countries needed to raise capital, trade in securities, and do business globally they would adopt Western practices. Institutions such as the World Bank and the OECD put considerable effort into advising developing countries about modern corporate governance practice. Globalization became a dominant feature in world trade because some countries offered significantly lower costs to developed markets. Some thought that globalization of the movement of goods, services, money, people, ideas and information, would inevitably lead to a convergence of intellectual insights, politics, and ideology. Such arguments are seldom heard these days. Capital can be raised in the East as well as the West. Securities can be traded on many stock exchanges. The notion, which might be termed ‘globalism,’ seems unlikely to survive. Attempts by countries to protect their own industry and labour markets, control the flow of people, money, and information across their borders challenge the onrush of globalization. Now, as the 21st century moves forward, discussion about corporate governance increasingly recognizes the significance of culture – national, regional, corporate, and board-level – to successful corporate governance.. The governance of companies within a country needs to be consistent with that country’s culture.